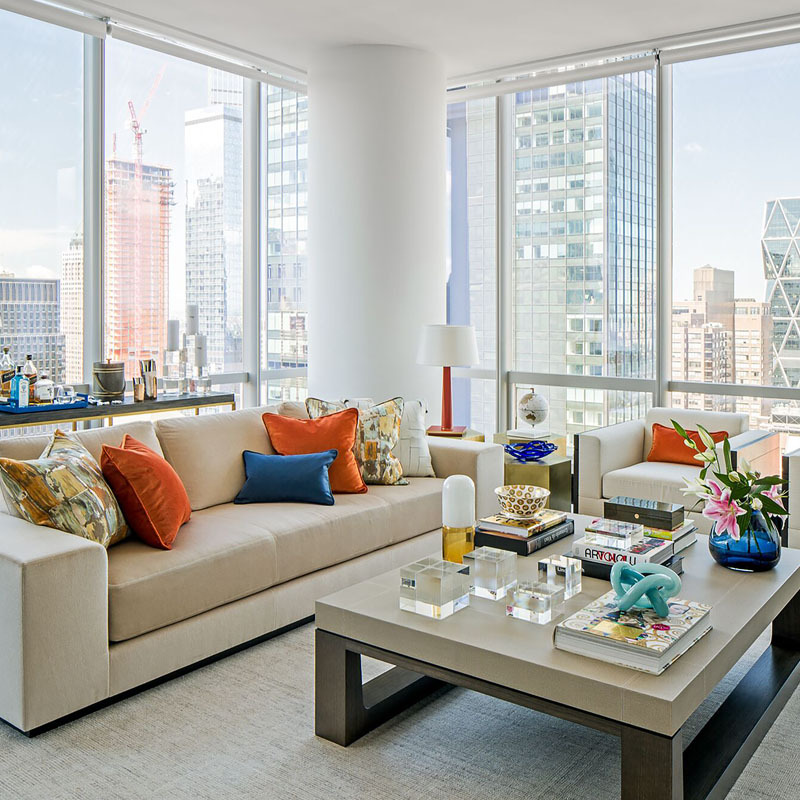 If you’re thinking about a living room renovation and are looking for inspiring design cues and money-saving ideas, you’ll be sure to find inspiration in these living room refresh hacks culled from the wisdom of Décor Aid interior designers. From smart ways to conceal that bulky television to reconsidering your ceiling, here’s everything you need to know. Mirrors can be found relatively inexpensively and in unique shapes and scales at that, plus they’ll make your living room feel well-lit, larger, and more luxurious. And if you’ve got interesting architectural features to work with, add them to your living room renovation budget and consider ways you can install them in a more unique way, rather than simply hung on a wall. When it comes to the foundation of living room renovation ideas, it always pays to start with flooring. From a fresh coat of varnish to layers of sumptuous carpets and rugs, starting from the ground up is sure to help you chart course easier. If you’ve got a large living room renovation ahead of you with a challenging amount of ample space to work with, create a cozy environment by grouping furnishings in clusters to create intimate conversational areas. Often neglected or completely forgotten, rethinking your ceiling can make a huge difference and shouldn’t cost a small fortune. From tin ceiling panels to easy to install molding to painted graphic panels to freshly exposed beams, there are an endless number of living room renovation routes you can go when it comes to creating a unique ceiling treatment. If you’re dealing with limited floor space and are short on living room renovation solutions, who says you really need a coffee table? Instead of taking up needed visual space with a bulky table, opt for glass-topped nesting tables that you can easily move and stow away. There is nothing more timeless than an all-white living room renovation. Painting your space white will make it feel much larger and it’ll help the room feel modern, completely timeless, and relaxing. Accent a white living room with neutral tonal shades here and there and be sure to create plays on texture for visual interest. For personality, bring in colorful accents to save the space from feeling too limited or spartan. 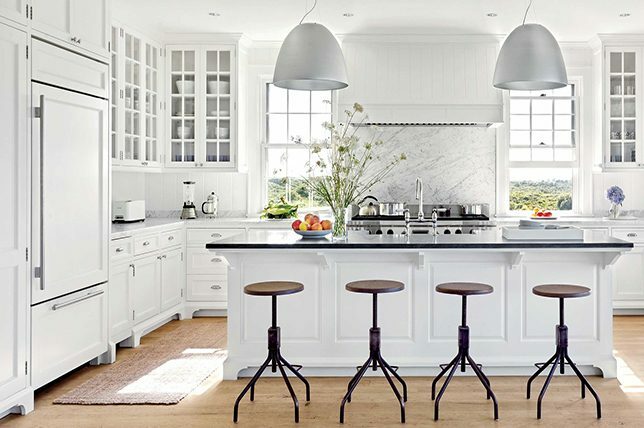 And if you are working on a tight budget and have other ideas in mind that are easier to justify when considering a living room renovation cost, a fresh coat of white paint is an affordable and easy way to create striking impact. What is a luxurious living room without pattern? For a rich look, layer multiple patterns together when planning your living room renovation ideas that are bound to make the space feel comfortable and all the more unique to you. Patterns are sure to add more depth to a living room and by contrasting patterns for your curtains, cushions, and upholstery, you’ll bring your living room design to life with ample personality. For dramatic impact that’s practical to boot, built-in floor to ceiling bookshelves can help to make your living room feel like a comforting sanctuary. Not only will they provide you with extra storage space, they can also be styled to create needed depth and personal flair. Floor to ceiling bookshelves will lend your living room a comfortable and cozy feel even though they are a grand gesture, and they’ll make your living room renovation look all the more luxurious and expensive. Have them installed along a main wall for added drama or in the recesses of a chimney or a corner nook to make the most of the space. Large bookshelves also won’t stretch your budget as they can be added rather inexpensively while adding to the value of your home. It shouldn’t come as major news that you can instantly add color to your living room renovation ideas with fresh furnishings – as color doesn’t always have to be reserved for your walls. 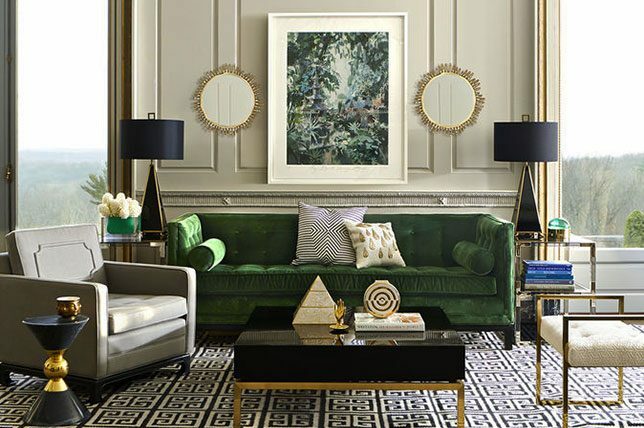 Choose a light and neutral color for your walls and make an impact with statement pieces of furniture, whether this is a bold velvet sofa or an interestingly colorful coffee table. Create visual plays that’ll bring your living room to life by contrasting the room with different colors, textures, and materials to ensure a vibrant living room. The key here is to bring colors and patterns in that sing to you and your personality as you don’t want the room to feel off or tiring to look at – like always, the perfect mix is all about finding brilliant balance. Wood panelling may sound like an unviable option, but when you go for a simple design in a dark hue, it can look hyper-elegant while being a great way to add needed interest and focus to an otherwise plain wall. An alternative to fresh paint or wallpaper, wood paneling can make your living room renovation all the more dramatic while making it look more grownup and luxuriously warm. You can opt for a natural wood or choose to paint your panelling (a dark tone works wonderfully here, as does optical white). However, wood paneling can be expensive and require more care, so it may not make for the best route if you are working with a limited living room renovation budget. We’ve said it a thousand times and we will say it again, adding plants in any room is a great way to brighten up your home and add an organic nod to nature throughout it. And like many of the ideas on this list, if you are looking for quick living room refresh ideas that won’t extend your budget like living room renovation ideas can, adding fresh plants around your the room will make an instant difference. Use air-purifying plants to fill a corner, becoming a focal point of the room, and use them to add color and liven up your space. This is also makes for a great low budget living room renovation idea, as it doesn’t have to cost an arm and a leg. 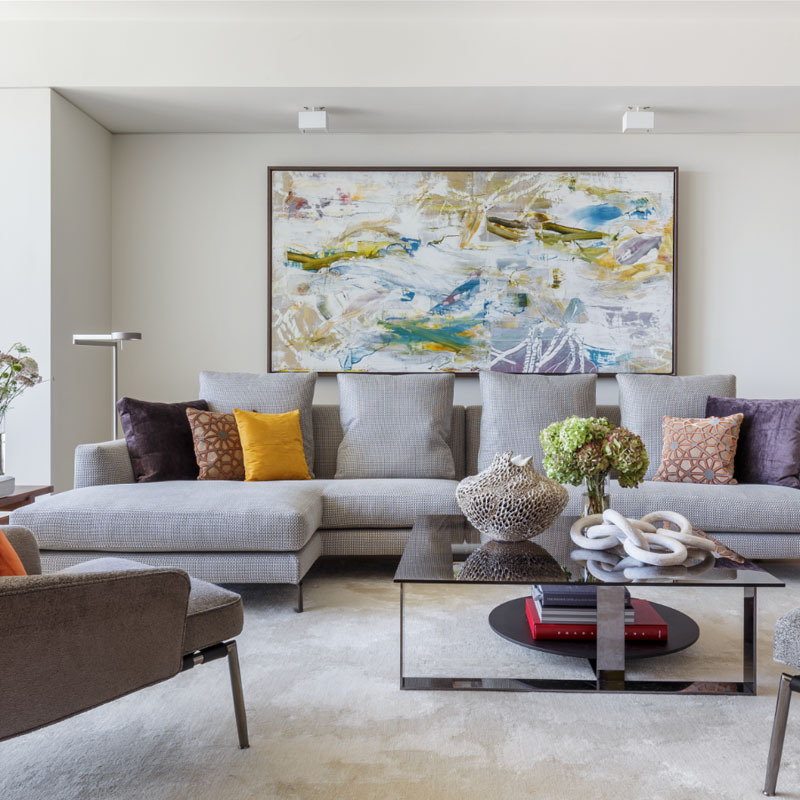 Art makes for a bold way of brightening up your living room while making the space your own with memorable personality. Art is personal and you can use your walls to reflect your personality and experiences. Install evocative paintings, prints, and drawings that hold significance to you (you are less likely to get bored of them when you feel a connection to them). Go for a gallery wall if you have plenty of art to display or take over a wall with one large oversized piece to really make a stunning statement. After all, a dramatic living room renovation doesn’t always just mean a fresh coat of paint or new furnishings. 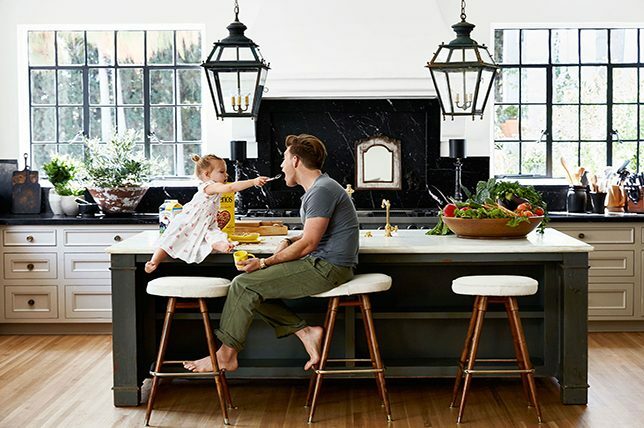 Retro-inspired home styling made a comeback at the latest interior design shows, and it only makes sense since the industry’s love of Mid-Century Modern décor never seems to wane. And when it comes to cost-effective yet game changing living room renovation ideas, graphic vintage-inspired, on-trend wallpaper can make a huge difference. Embrace your love of vintage styling cues and go for striking retro-style wallpaper to liven up your living room. Use it to create a feature wall or be bold and cover the entire room. Balance out a heavier retro-inspired wallpaper print by bringing in more minimal furnishings and upholstery to keep your living room renovation looking modern for years to come. When it comes to a beautifully realized living room, there’s nothing worse than seeing a television used as a starting point. 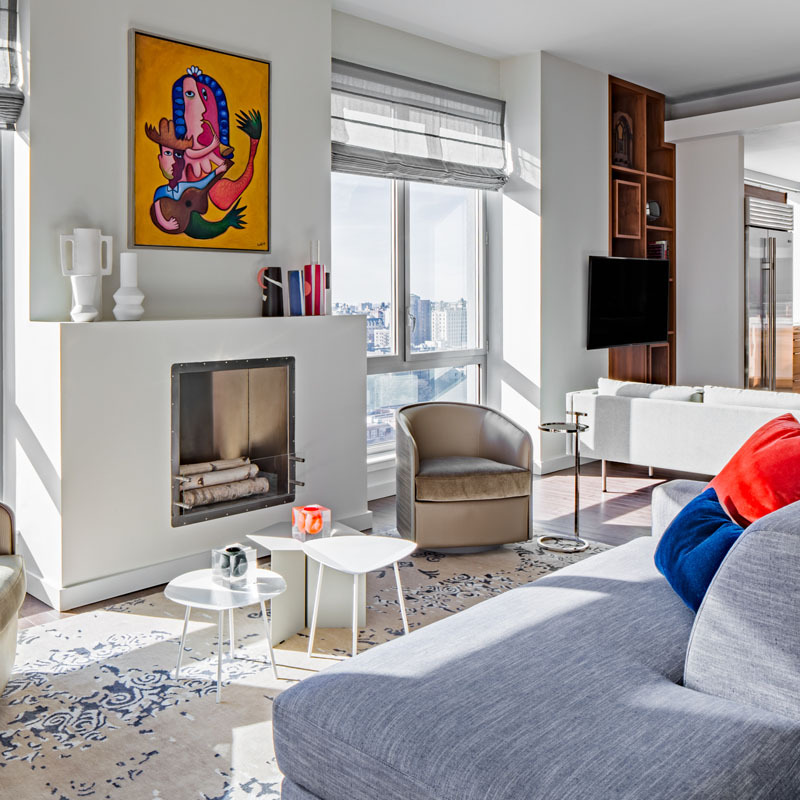 Sure, it’s practical to consider entertainment purposes when you’re planning a living room renovation, but practicality only goes so far when it comes to everyday elegance. But, with a little ingenuity and smarts, you can conceal your TV inside of a stylish armoire that’s closed when it’s not in use. Or if you have an ample budget, a clever built-in storage unit will add value to your home while reducing the impact of a TV. But if hiding your TV won’t do, there are plenty of ultra-slim, attractive TV’s on the market to consider. 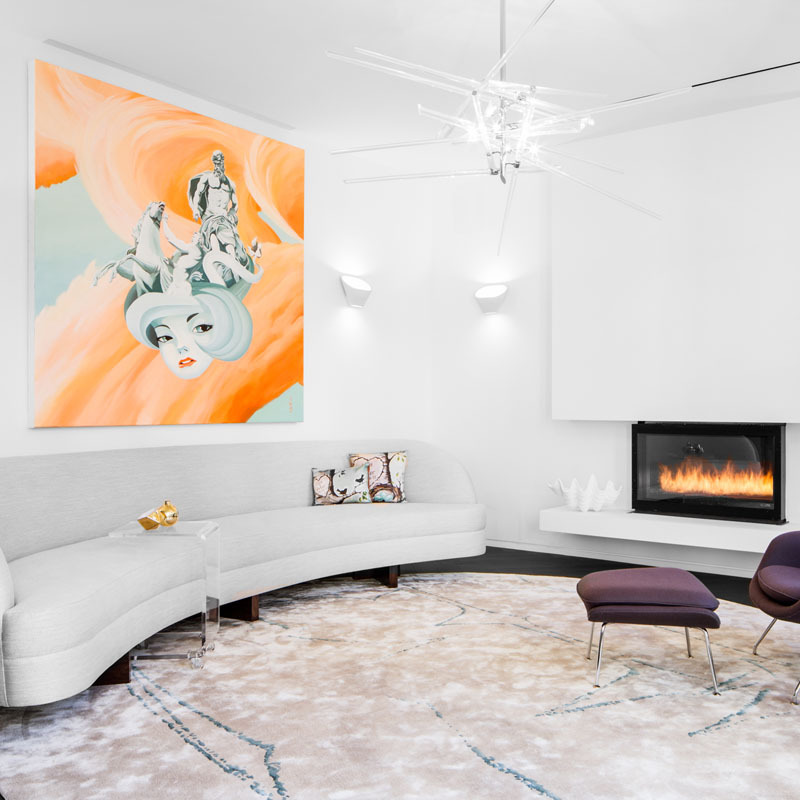 From ribbons to ones that are designed to almost look completely concealed, if you’re thinking about updating your fireplace during your living room renovation, there are plenty of high-style, high-function modern fireplace styles to consider. And though they can be an investment, they will also work to increase the resale value of your home instantly. And if you have a fireplace in your home that you don’t use or never will, you can make the most of the alcove space be using it as a decorative display area. Paint the inside of your fireplace in a contrasting color and make a feature out of it by stacking colorful art books in it, or you can place a range of extra-large candles in it or turn it into the perfect place to highlight collectibles. In use or not, a fireplace gives you a real design opportunity to take advantage of for your living renovation. Plus, using an unused fireplace is an affordable alternative, so it will keep you well within your living room renovation budget. 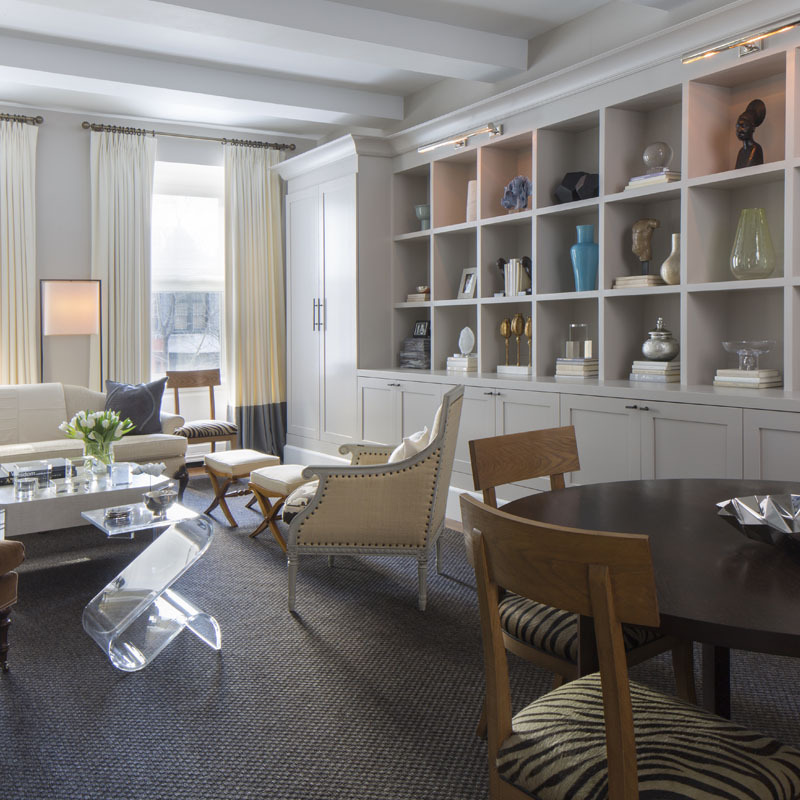 Pendant lighting in a living room can instantly add an air of elegance without costing a small fortune. 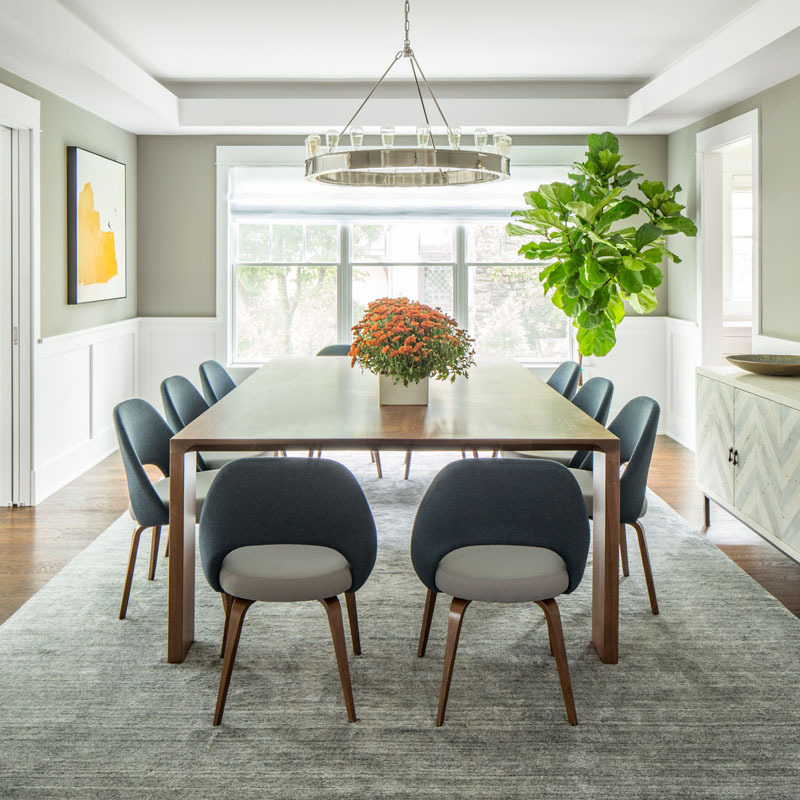 When installed to hang low, pendant lights can make your living room feel cozier and more intimate, while becoming a defining feature and striking focal point. 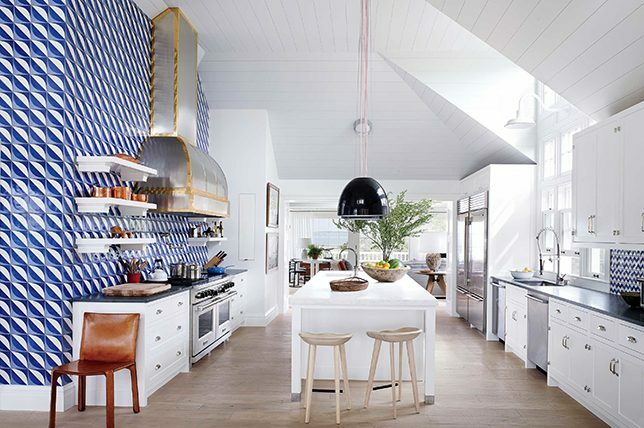 If you are looking to create a memorable impact, select some statement-making lantern-inspired pendant lights, or lighting alternatives that fit in better with the style of your living room if you are simply looking to add more intimacy and warmth. 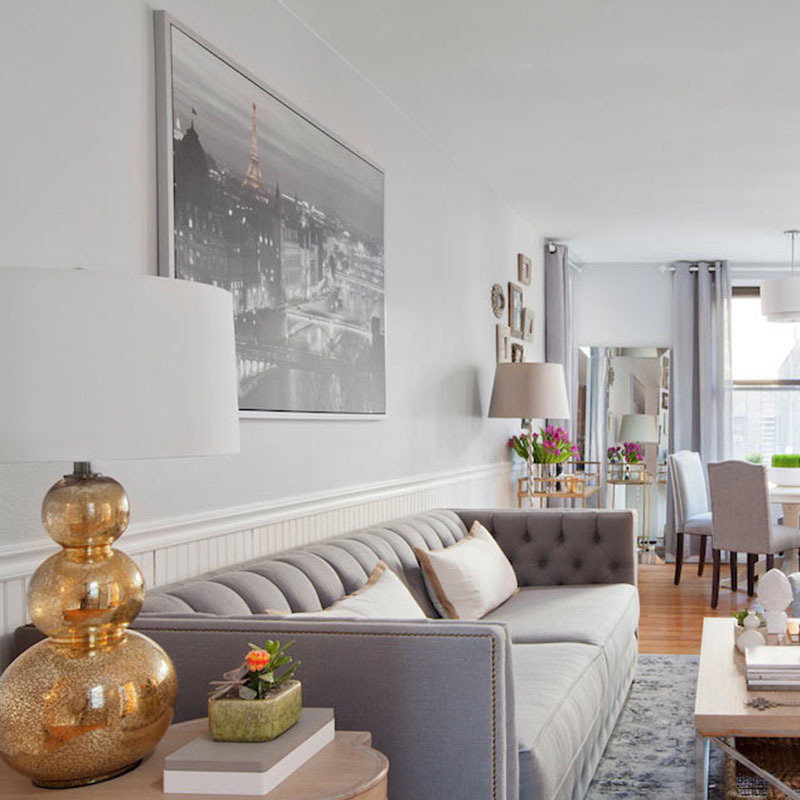 Any living room renovation will feel more complete and well-judged with the addition of pendant lighting, especially when they’re framing your coffee table in multiples. A statement-making chandelier is a sure-fire way to add unexpected elegance in any renovation for a living room. And with modern chandelier iterations, they don’t always have to be filigree and crustal. You can have one installed to help you create a more glamorous living room design, or use a chandelier as a way to catch more light during the day if you’re working in a more darker living room. 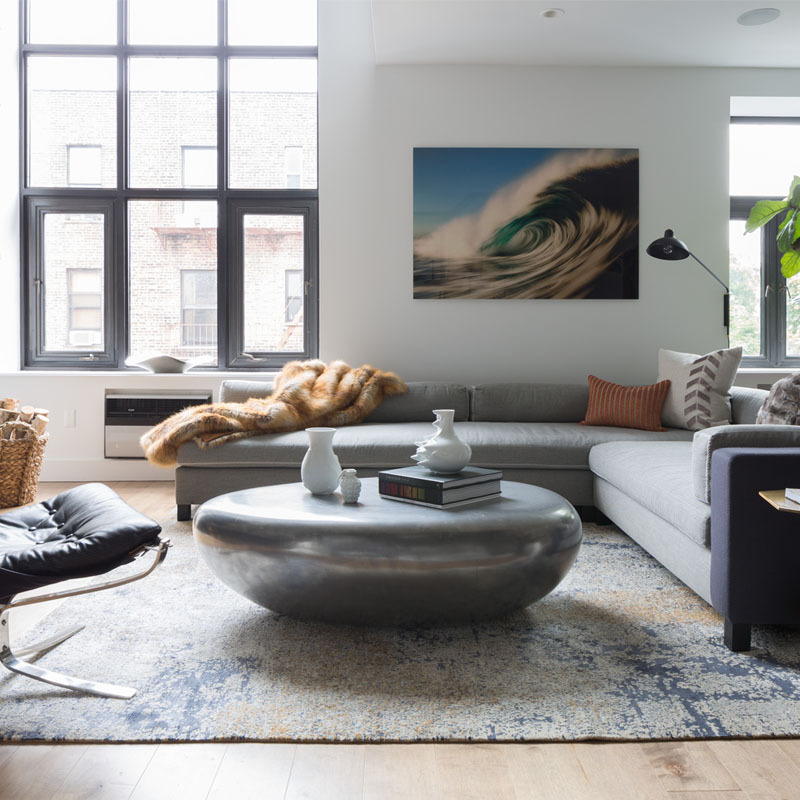 And while it can be an expensive addition to a living room renovation, it can also pay off when you’re looking to resell your home. That said, don’t limit yourself as chandeliers come in all shapes, sizes, and styles, from traditional to the more modern. Even better if you are working on a large living room renovation and add more than one to make the room pop. 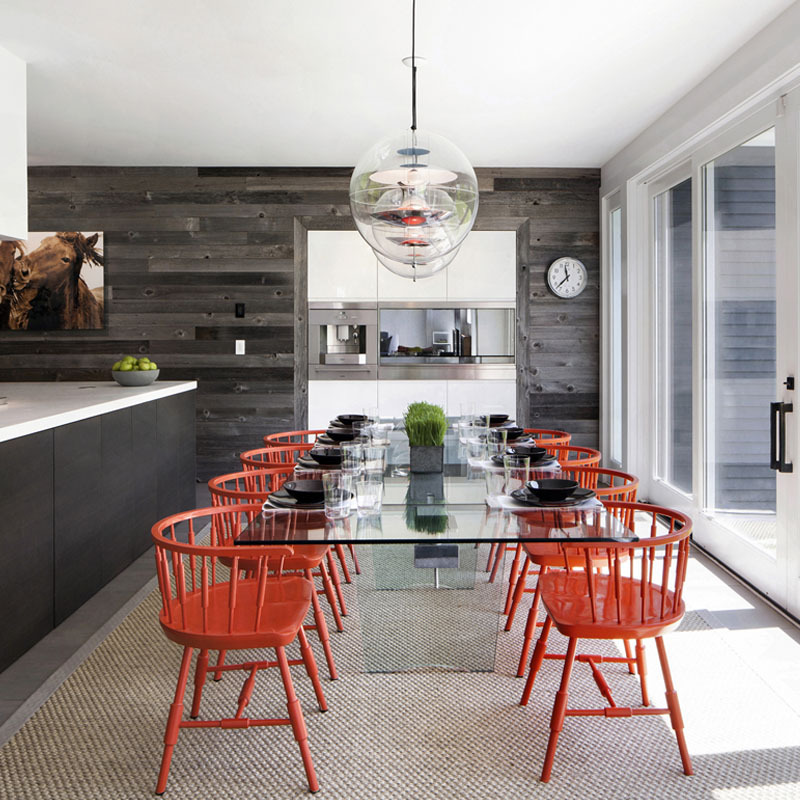 Dark, moodier colors continue to trend when it comes to renovations for living rooms, and for good reason. Painting your living space in a deeper tone will make the room feel inherently more comfortable and intimate, creating a relaxing space for you to entertain in and use to your advantage. By going for a rich and indulgent dark color, even if its a khaki like above, you’ll have an easier time tying all the furnishings you have in your living room together, and you’ll make it all look more expensive to boot. But if you’re dealing with a small space that doesn’t get much light, you can also tune your living room renovation ideas towards reimagining the flooring in a deep hue, like a high-gloss black to catch light. A dark color will also help a living room feel less disjointed (especially if you have challenging nooks and cranny’s or doors which break up walls or worse, the room itself). Plus, a fresh coat of paint makes for a handy alternative to maxing out your living room renovation budget. It might seem like an obvious route, but making the most of the architectural features you already have in your living room will make it feel all the more unique while helping to guide your decorative process. Don’t let those sometimes odd features go to waste or left untouched – make room-defining features out of fireplaces, beams, exposed brick, alcoves, and recesses. Play to the advantages you already have in your space and allow those quirky elements to help make a statement in your living room renovation. Plus, working with what you already have will allow you to reduce living room renovation costs. And you’ll find yourself having fun finding creative solutions to what wouldn’t ordinarily work somewhere else.